Ready for a simple dinner idea that your family will love? 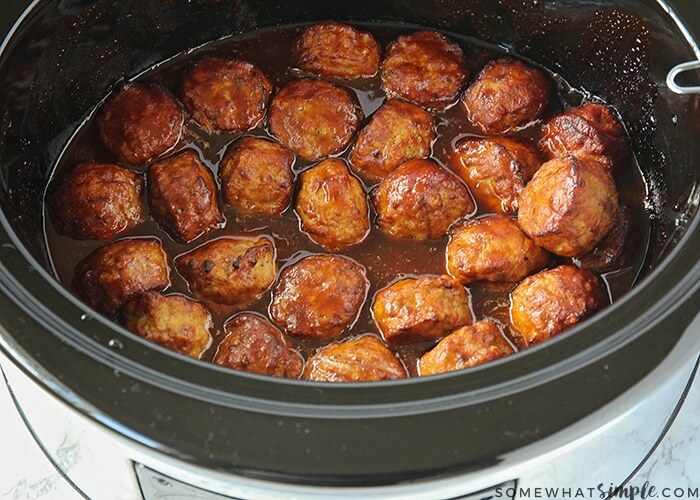 These grape jelly meatballs that you make in a crock pot are just for you! Using just 3 ingredients, dinner will be ready in not time. I love these easy meatballs because they are so versatile. You can whip up a batch of Garlic Mashed Potatoes and serve them for dinner or serve them alongside some Ham and Cream Cheese Roll Ups as an appetizer at your next Adult Game Night. My family LOVES meatballs so we make a variety of recipes using them quite often. 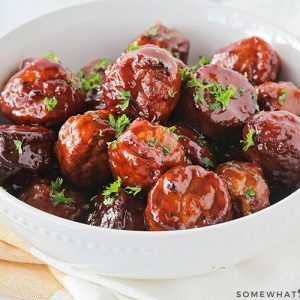 I’ve shared our Sweet and Sour Meatballs recipe, which has an awesome flavor, but the grape jelly meatball recipe I am going to share with you today is not only very delicious, but it is even easier to make. 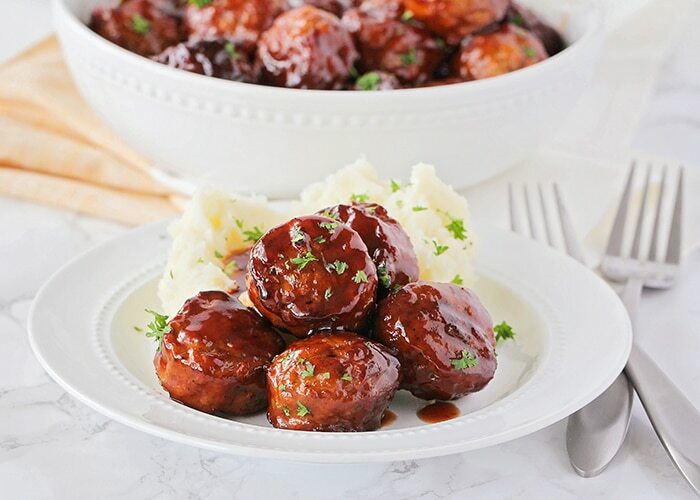 ANNNND these grape jelly meatballs are made using only 3 ingredients that you literally place in the slow cooker and forget about until you are ready to eat. I love easy foods that tempt my taste buds! 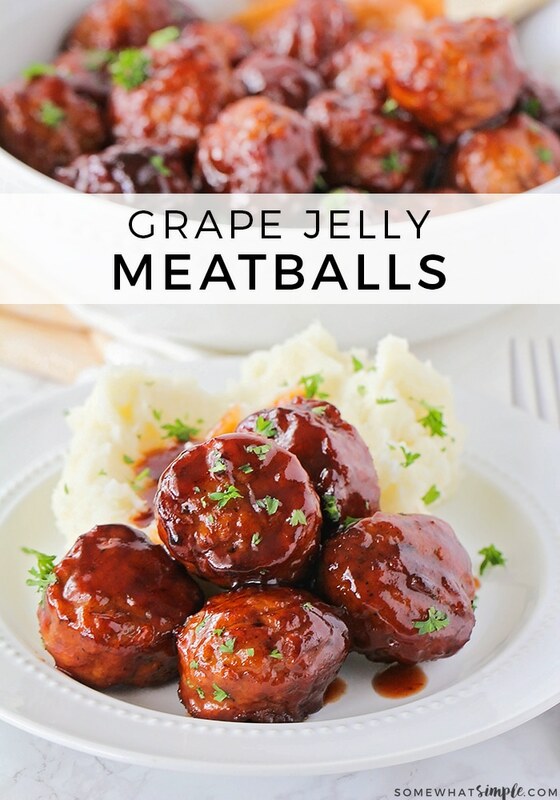 To make these grape jelly meatballs, you’ll need 3 things – a bag of meatballs, 1 jar of BBQ sauce, and one jar of grape jelly. Toss the meatballs in the crock pot, pour the sauce and jelly on top, then leave it alone. Dinner will be done in just a bit! This meatball recipe that uses grape jelly is so easy and is made is just a couple easy steps. Plus, I have created a short video showing the delicious and easy process at the very bottom. Yes, you can definitely freeze these meatballs to eat later. Wait until the meatballs have completely cooled and then place them in an airtight container with the extra sauce before freezing them. I typically wouldn’t leave them in the freezer longer than two months. When you’re ready to use them, just put them in the crock pot and warm them up. 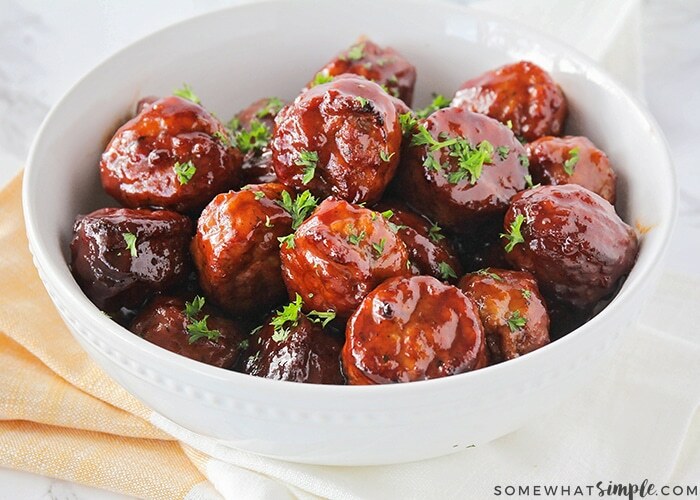 Yes, you can cook raw meatballs in the slow cooker using this grape jelly meatball recipe. I like to keep it simple and use frozen meatballs but if you can definitely make your own meatballs. If you do, you have to try our easy Homemade Meatballs recipe. If you decide to make your own, use a kitchen thermometer to be sure the internal temperature of the meatball reaches 165 degrees F.
And here is the simple recipe- let’s get cooking! These meatballs are easily one of our family’s favorite things to eat. Leave us a comment below and let us know how you liked them or tag us on social media the next time you serve these at a party you’re hosting so we can see all of the fun you’re having! Ready for a simple dinner idea that your family will love? 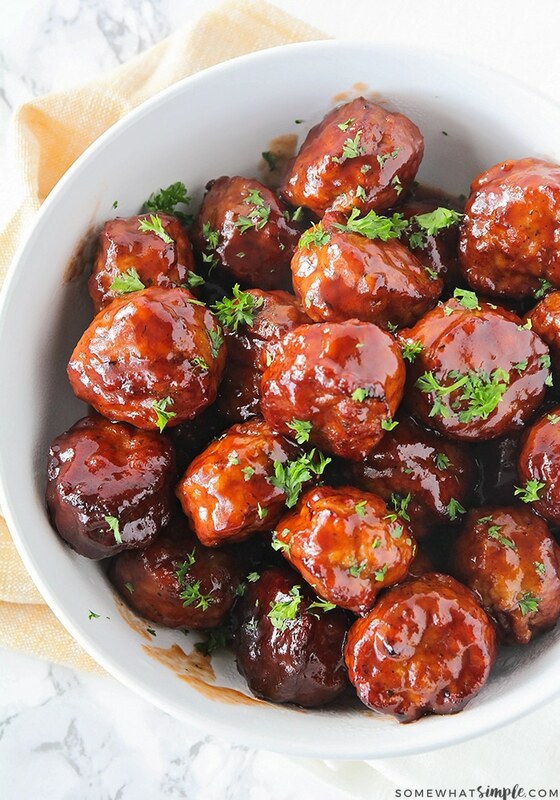 These grape jelly meatballs that you make in a crock pot are just for you! Place the frozen meatballs into your crock pot. In a small bowl, mix together the grape jelly and BBQ sauce until well blended. Pour over meatballs. Cook on low all day or on high for 2-4 hours. Serve as a party appetizer or partner with mashed potatoes and dinner rolls for a delicious dinner! Seriously, how good does that look? That sauce is pretty darn amazing!! 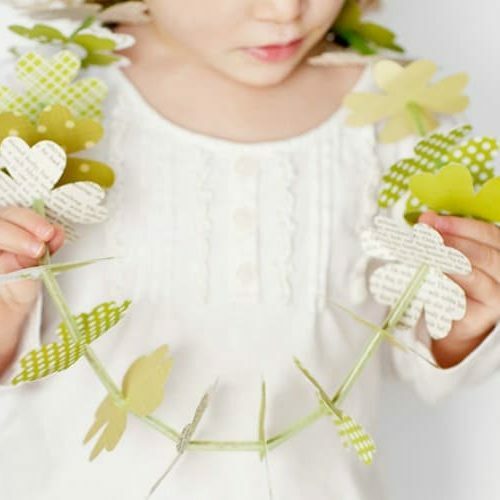 Give it a try – your family will not be disappointed – I pinky promise! 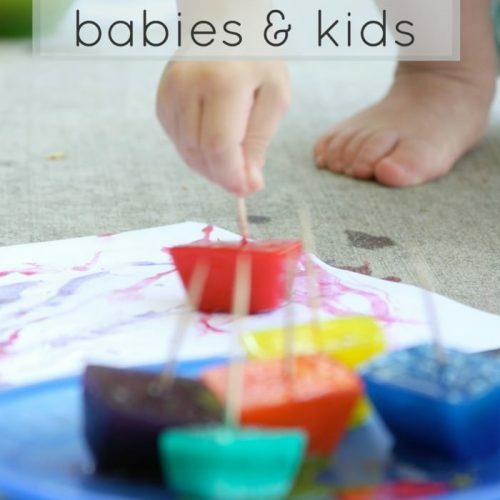 This recipe originally published on Somewhat Simple in February 2014. It was updated in June 2016 and still reigns as one of our family’s favorite dinners! The easiest appetizer and always a hit! We make this recipe so much. It’s avsilutely delicious. One to keep on the rotation for sure. Yummy!!! What a crowd pleaser! So many delicious flavors going on! These look delicious! Thank you so much! This is one of my favorite tailgate recipes! I’ve made these before and my family ALWAYS loves them! Try it with red currant jelly instead of grape jelly. It is wonderful! I made mine with cranberry sauce last night, and served it with rice. Its yummy. I am making it this way for Sunday dinner this weekend! My mouth is watering just thinking about it! Thanks for stopping by Tina! I love these! And you can make them just to your taste. I’ve made them with italian style meatballs, regular beef, and swedish as well (that’s my favourite) with little smokies, and the lil’ polskas. I love to do the grape jelly with chili sauce for sweet and spicy. I need to try adding some chili sauce- that sounds delicious!!! Thanks for the idea! It will take me a bit longer for preparation as I am dairy and gluten intolerant, so would have to make my own meatballs, but am keen to try it out, looks yummy. It’s super yummy 🙂 Thanks for stopping by, Lynette! I have made this recipe for years. Very popular. Also with little smokies. YUM! I need to try it with smokies! Hey sorry if this is silly but I am australian, just wondering if grape jelly means actually jelly you make from crystals or if you’re talking about grape jam that you’d spread on toast? These look wonderful and I would love to try them! this is one of my favorite meals. my mom makes it, and she makes the meatballs from scratch and uses cranberry sauce. i’ll likely do this easy route! we then pour them over rice, and meatballs and rice is the best thing ever. I am definitely going to try the cranberry sauce idea! Silly question- I have never done meatballs in my slow cooker…if you make them from scratch, do I cook them first and then just flavor them for a bit in the slow cooker with the sauce or do I put them in raw? These look really good. I was planning on making meatballs from scratch this week. Maybe I’ll make them and stick them in the crockpot with the jelly and BBQ sauce! Visiting from the Link Party Palooza! Yum! I definitely prefer homemade meatballs- can you send some my way? 🙂 Thanks for visiting Michelle! Thanks Dee! I appreciate you stopping by! I literally just made these. So yummy and somewhat low carb. I used Texas BBQ sauce that had a little heat. Great for midday munching. I plan on trying turkey meatballs for a birthday party next week. Thanks for sharing!! I had forgotten about these meatballs! I’m getting some on my next trip to Costco. They really are tasty! Thanks for stopping by Marianne! 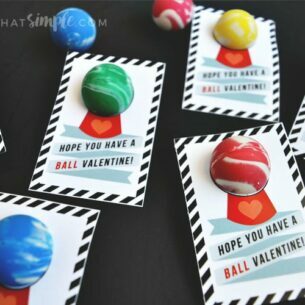 These look fantastic and oh, so easy! My family would absolutely love these at our get togethers. Yep, your family will love them! Thanks for stopping by Chelsea!